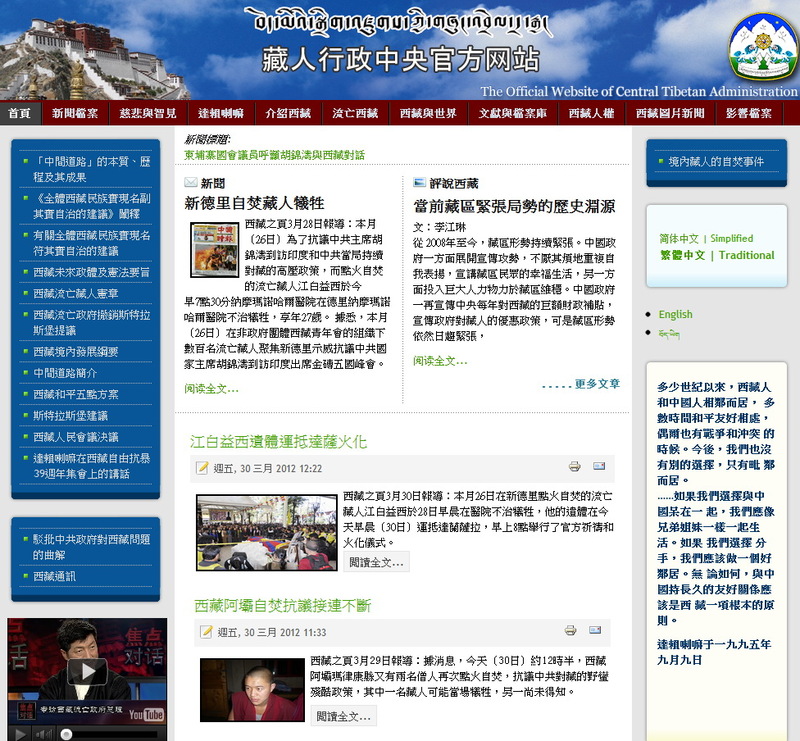 High Peaks Pure Earth has translated a blogpost by Woeser written on March 5, 2012 for the Tibetan service of Radio Free Asia and posted on her blog on April 1, 2012. When I disagreed with the leaders of the Tibetan government in exile, it caused hitherto unknown hesitation and confusion, even though I only suggested that when counting the numbers of self-immolations in Tibet, one needs to go back and take into account the first case of Tapey in 2009. Some voices from outside Tibet self-confidently expressed that in times of hardship everyone should be united, no one should raise petty criticism and let trivial matters influence the general situation; at this moment, one needs to strengthen leaders’ authority and must therefore not criticise… These kinds of words are all too familiar to someone like me who lives under an authoritarian regime, the autocracy uses very similar reasoning to request all members of society to entertain “collective will, collective action, and collective discipline”. However, the criticism of leaders is an elementary state of affairs in democratic societies. By suppressing this criticism, regardless of what the motivations or reasons are, the result will always run counter to democracy. Mature democracies will never refer to a newly elected leader as the “mighty leader”, but as an object that needs to be controlled. “Don’t trust the President” is the starting point of democratic philosophy, taming the government and leaders is the basic task of democracy. And in order to achieve this, one must, above all, rely on the freedom to criticise. Hence, in democratic societies people constantly confront their leaders with “petty criticism”, regardless of how important the matter really is. Indeed, we are in a difficult situation but this is not a reason to reject criticism; on the contrary, we need criticism to prevent leaders from making mistakes. If criticism does end up destroying unity, then it is always the leader who has to take responsibility for this, because as long as the leader accepts criticism, unity will improve. Aristotle once said: “virtue is one integral whole” – people do not respect virtues when it comes to “important matters” and then, for practical reasons, reject these exact same virtues when dealing with “trivial matters”. In fact, any abandonment of virtues, no matter how insignificant they are, represents the beginning of a whole moral degeneration. In the same line, the “general situation” and “trivial matters” are one integrated whole; the problems that “trivial matters” reflect do just as much exist within the “general situation”, criticising “small matters” does not only influence the “general situation”, it, in fact, positively contributes to it. Of course, democratic societies can also generate great leaders, but these merits are only granted after a leader leaves office and not when he or she is newly elected. Being elected cannot serve as proof of greatness, it is merely the beginning of a process of inspection. Looking back at history or around the world today, there are many examples of leaders who have squandered the trust they enjoyed when initially elected. By accepting to learn from the mistakes of predecessors, those who have been elected should regard criticism as a kind of positive remedy, enabling them to avoid entering the list of those who have failed and hence, they should appreciate criticism. His Holiness the Dalai Lama’s authority is inherent and supreme and enjoys unconditional recognition from Tibetans. The reason why His Holiness withdrew his authority from the political realm is not to have a different person replacing it. Neither is this necessary nor would the people accept this. His Holiness wants a fundamental transformation, just like the Taiwanese democratic slogan says “the people are the greatest”, he wants the people to turn into the political authority with leaders only being public servants, serving the people. The way to inspect the level of democratisation of a specific society is by looking at its leaders’ attitudes. If they are arrogant, conceited and arbitrarily denounce other ideas and opinions it means that the leaders have not yet understood what democracy is really about and it also means that the society has not yet achieved the empowerment of the people. Unlike the unshakable legitimacy of His Holiness, it is an inherently difficult task for the political leaders of the Tibetan exile government to establish their legitimacy as representatives of the 6 million Tibetans living inside Tibet after the Dalai Lama withdrew from politics; but their source of existence comes from Tibet and hence, the issue must be resolved. Only relying on several ten thousands of votes from exiled Tibetans is not sufficient. As long as Tibetans living in Tibet cannot themselves vote for their own leaders, the legitimacy to represent them has to be created and embodied through the close exchange and communication between the exiled leaders and the Tibetan people inside Tibet. This exchange includes praise as well as criticism and it is a process in which the leaders of the exile government should at the very minimum show their modesty, benevolence and active engagement. A higher level of legitimacy would be achieved by providing Tibetans living in Tibet with real guidance and useful methods and by performing an effective role as leaders. Everyone knows that this is very difficult, but it is precisely those, and only those, who can achieve a breakthrough in such a challenging and difficult matter that will one day become great political leaders.